Start at the action-packed Djemaa el-Fna, and if you can tear yourself away from the castanet-clanging water-sellers and turbaned potion-sellers, head into Marrakesh's maze of covered market streets. While you're in the heart of the Medina, you may come upon a palace museum, stay in a riad guest-house, and venture a dish of piping-hot snails. Marrakech is one of the world’s great Imperial cities. Situated in the heart of Morocco, Marrakech is jam-packed with a myriad of things to do see and do and unsurprisingly attracts hordes of visitors from across the globe. Head to the Medina (old city) for an assault on all of your senses, it will really feel like you’ve stepped back in time onto the set of a medieval film. The huge thick, towering walls are full of goats, chickens, donkeys, houses, traditional businesses, beautifully restored Riads and the famous souks where you can buy crafts, colourful textiles, rugs, slippers, metalwork, spices and jewellery. Explore the alleyways by foot, horse-drawn carriage or taxi – often the journey is an experience in itself! Many of the Riads - traditional houses or palaces with an interior courtyard – are now luxurious boutique hotels. Many resemble the pages of an interior design magazine with exquisite architecture and stunning views from the roof terraces across Marrakech and across to the Atlas Mountains. There are a good choice of airlines operating direct flights to Marrakech such as BMI and British Airways. Low cost flights, which are also direct, can be found on Ryanair and easyJet. Close to the Souks and in the heart of the Medina is the famous Djemaa el Fna Square, allegedly Africa’s busiest square, it is usually full of snake charmers, story tellers, dancers, acrobats, castanet clanging tea sellers and busy hawker food stalls. Dating back to 1062, Marrakech was founded by the Almoravid dynasty who recruited the finest architects and craftsmen to build the beautiful palaces, mosques and baths complete with a subterranean water system. The walls were built from mud and clay from the red plains nearby and are in dazzling contrast to the often snow-capped peaks of the Atlas Mountains which can be seen in the distance. Other famous attractions in Marrakech include the Koutubia Mosque and the chic Majorelle Gardens designed by Yves Saint Laurent which provides an oasis of tranquillity in this bustling city. Marrakech is home to hundreds of restaurants and eateries with a fusion of North African and French cuisine. There is a great choice of restaurants bordering Djemaa el Fna and in the alleyways which lead off it – the restaurant La Marrekechni serves traditional Moroccan food and you can dine on the balcony whilst enjoying the entertainment in the square. For something more sophisticated, head to Le Tobsil Restaurant and follow the man with the lantern through the Medina for a delicious banquet of food in a theatrical setting. Just complete and click on our flight search box to find a great choice of cheap flights to Marrakech, Morocco. Prices will tend to rise the closer you are to departure so for the cheapest flights we would always advise that you book well in advance. If you need to organise a late getaway, have a look at our offers on lastminute flights. 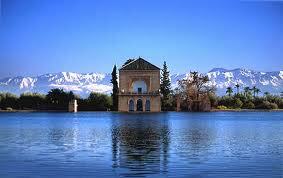 Marrakech features a semi-arid climate, with mild wet winters and hot dry summers. Average temperatures range from 12 degrees Celsius in the winter to 23 degrees Celsius in the summer. The wet winter/dry summer precipitation pattern of Marrakech mirrors precipitation pattern found in Mediterranean climates. However the city receives less rain than is typically found in a Mediterranean Climate, hence the semiarid climate classification.